Prior to physical birth, all souls who have decided to incarnate on Earth would have been asked to enter into a contract/a promise with Gaia. All of you had promised to look after your planetary home in the best way that you can, every single day. You had also made the promise to treat all of Gaia's living inhabitants sharing the same space as you, with much love and respect. Some people think deforestation is normal; that it is okay to cut down as many trees as possible and leave many parts of the land barren. After all, humanity needs paper, furniture and houses to build. And these trees are just a means to an end. Some people even gave themselves 'a pat in the back' for planting a tree or two, for every single mature, old tree they are cutting down. They never realized that the existence of these old trees is the reason why there is plenty of fresh oxygen to go around the Planet for all of you to breathe in. These trees also contain much Wisdom of all the Ages. All of you who currently possess the ability to communicate with all in the Plant Kingdom have found these trees to be living, divine beings so full of wisdom, love, joy and humor. Don't even get me started on the suffering of those in the animal kingdom. It truly brings me to tears every time I see Gaia, and her 'seemingly' voiceless inhabitants being abused sometimes to the point of brutality every single day; numbering by the billions all over the world. This entire madness has to end. It will definitely end. In fact, it has already ended in the great NOW moment where Nova Gaia exists. What humanity has failed to realize is that when you look into the eyes of any animal for a prolonged period of time, you will begin to see Me in all of them. I Am Omnipresent. I am in the very air you breathe; the water you drink. There is Nowhere That God is Not. You who possess this higher level of energy sensitivities (the group of people who are sometimes called empaths) have had the hardest time living on Earth. They could feel and be easily affected by the immense suffering of Gaia and many of her inhabitants. Some of you reading this have even reached a phase where you have truly embodied Oneness and Unity consciousness and thus been able to telepathically communicate with Gaia, and all in the Plant and Animal Kingdoms. You 'know and feel' very well the extent of damage Gaia and her 'voiceless' inhabitants undergo each day. One could participate in rallies; one could also go be a 'tree hugger' or become a vegetarian/vegan. But deep down, all of you who were already doing these, still felt like these actions did not really help much to change the world. After all, respecting other souls' free will is also part of your path of Light and Love. "Please stay centered in the Light my beloved children, and do not despair nor feel helpless. The third dimensional way of living is now coming to an end. Very soon, LOVE will be the only name of the game. 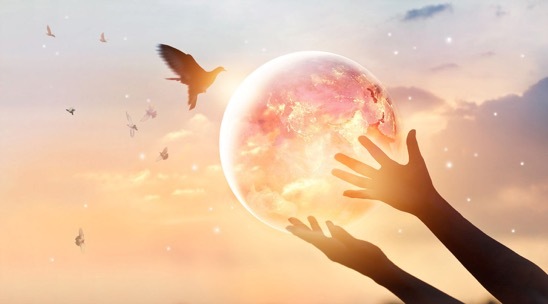 The way of violence, cruelty, abuse, intolerance, injustice, discrimination or neglect will soon no longer be accepted nor tolerated by the majority of Humanity who has been longing to live in the spirit of Peace, Love, Unity and Abundance. Due to your heightened sensitivities I know, my highly-empathic children, that you have suffered just as much as the world around you have suffered, and for this very reason, you will all be called to be the fifth-dimensional leaders in your own fields of expertise. Tune in everyday to your own inner guidance, your own Higher Heart/in-built GPS, and we will work together to change all aspects of Earth's third-dimensional, everyday living, into the spirit of Oneness and Unity. You are meant to be wherever you are, right at this great moment in time. Have faith that everything is going perfectly right now, according to Our Divine Plan." After all the dust has settled, and when the inhabitants of Earth are starting to embody Unity and Love for ALL, Earth will enter into a period of Peace. Everyone's main focus will be on spiritual growth and becoming Masters of Creation and Manifestations. There will be 'Mystery Schools' opening up in many locations throughout the planet that will teach their students the path of Unity, Mastery and Enlightenment. Everyone will work together with your Galactic Brothers and Sisters, to bring about planetary healing and the establishment of a fifth dimensional paradigm in all aspects of human existence. * Money (of all kinds: paper, coins, gold etc.) will one day become obsolete. If you need/want something in your life, you can use spiritual powers, your own powerful Divine powers of Creation, to create it out of thin air. The concepts of taxation, banking and conducting a business for profit will also become obsolete when money no longer exists. The existence of money (and how much one has) will no longer be one of the causes of division and separation within Humanity. * Everyone will be called to live to serve the Higher Good of all on the Planet, in a way that best suits your own talents, gifts and calling. You will be completely focused on spiritual advancement and serving Love in all that you do. Working 9-5 in a job that 'just pays the bills' will be a thing of the past. Everyone will be living an abundant life, and thus be 'financially' free to pursue their own passion; their own paths of joy and fulfillment. * Humanity will be a race of being that, predominantly, communicates via telepathy. You are able to sense/know each other's thoughts and can send messages, across great distances, via the powers of your fifth-dimensional Mind. You will learn how to be Master of your thoughts in the early years of living in Nova Gaia. * There will no longer be a need for a government for every single nation/country on Earth. In all spiritually-advanced societies throughout this Universe, there is only ONE Planetary Government/Leadership that consists of representatives from all the nations/all the different cultures of that world. Think of your 'United Nations' but in a larger, more Unified scale. Your newly-elected United Nations; your planet's Central Government will be responsible for making decisions and providing guidance in anything that can potentially affect the human race as a whole. Your elected leaders will consist of only highly-evolved humans who have the purest of intention to serve Divine Light and the Greater Good. * All of you Gaians (which you will soon be called, and not Earthlings *laugh*) will be warmly welcomed with great Joy and Love into the group of higher dimensional civilizations, and be active participants in the Galactic community. And this means: the entire Universe will open up for you all. Other planets, galaxies and star systems will serve to be your playground. Space will no longer be an 'Uncharted Territory' for future Gaians. I am sure many of you have known by now, that spiritually and technologically advanced races of beings, such as the Pleiadians, Arcturians, Venusians and many more, have acted as Guardians of this Galaxy for eons; for a very long time. They have guided and protected Humanity in service of the Light and Divine. One day, (when humanity has grown to be a spiritually-advanced race), Gaians will also assume that role, and become protectors and guardians of another planet/another civilization that will be undergoing a massive move from the lower to the upper dimensions of consciousness. The promised Kingdom of Heaven on Earth is NOW here, and it is up to each and everyone of you to claim it and make it yours. As always like with anything else, you have the freedom to be a part of it or not to be a part of it. We respect each soul's individual decision and will assist all of you in your own spiritual evolution.